“The child of Cocteau and Godard” (Jacques Rivette), “the proverbial underrated genius” (Olivier Assayas), Philippe Garrel began making films at sixteen, fired by a mythopoetic vision and a political fervor that crested and crashed in May ’68, whose turmoil he filmed (the long-lost, newly discovered Actua 1), and re-created from memory (Regular Lovers, both of which will screen in Part 2 of this retrospective). In the fallout of this popular uprising, the dandy-in-the-underworld produced a darkly dazzling cycle of what Philippe Azoury called “alchemic and symbolist films, a cinema in suede boots.” Then, beginning with 1982’s L’enfant secret, Garrel became something of the patron saint of narrative minimalists, making pared-down, cloistered works fascinated with the significance of minute gestures yet encompassing wider world affairs both social and romantic. 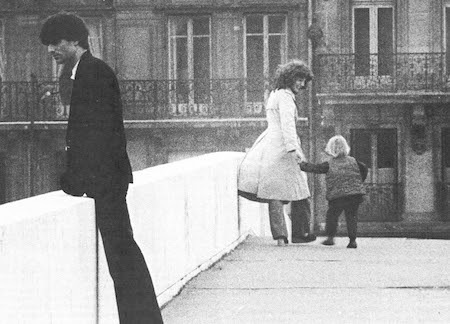 Garrel’s reflective films draw heavily on his autobiography—the women in his life, including the chanteuse Nico, his companion for a crucial decade-long interlude; his addictions and inner turmoil; a family of politically-engaged artisans, incorporating as actors father Maurice, son Louis and most-recently daughter Esther, alongside comrades Jean-Pierre Léaud, Anne Wiazemsky, Pierre Clémenti and Zouzou. Part 1 of this retrospective, which will be the most complete yet in the United States, opens Thursday October 12, includes recent digital restorations and new 35mm prints, providing a once-in-a-lifetime chance to experience fifty years of work from cinema’s foremost poet. Philippe Garrel: Part 2 will open in November. Presented with support from the Cultural services of the French Embassy in New York. With special thanks to Claudine Kaufmann, Nicholas Elliott and Pip Chodorov.